This challenge features an inviting quartet to inspire your next project — Peach Bellini, Coral Crush, Green-Eyed Monster, and Spearmint. This combo simply screams "flowers" with it's peachy hues and greenery-inspired colors. Barbara used the Spring Wreath stamp set and Die-namics in her interpretation of the palette - switch out your color choices to make a wreath appropriate for any season! 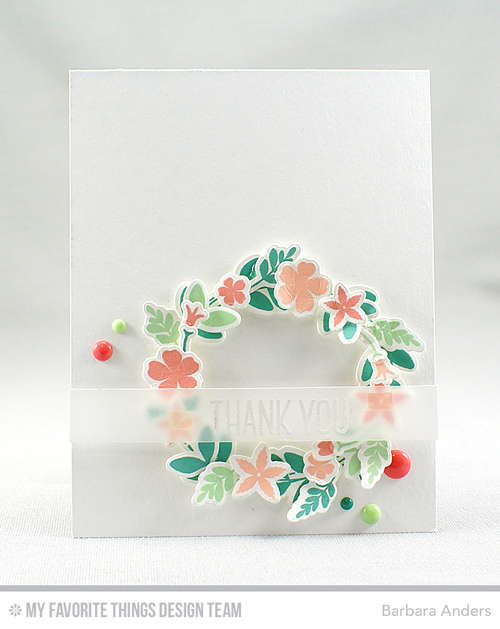 Vika also went the floral route, opting to use our new Sketched Blooms 2 stamp set. She kept her card relatively flat (an imminently mailable!) with a stamped pattern accented by a simple die-cut fringe border and sentiment. Feeling hungry? If you weren't before, you will be now that you've spied Anna's delicious look. 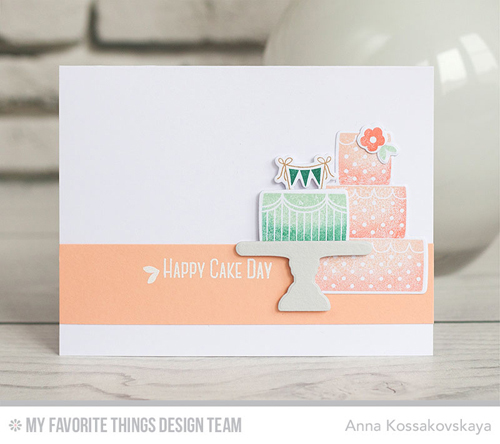 She's baked up a gorgeous card with the Celebrate with Cake images from Lisa Johnson Designs. Congratulations, Kelly Szafron! You are the randomly selected winner of the MFT Color Challenge. You can view all the entries from the last challenge HERE. You have until Wednesday, February 22nd, at noon EST to add your link and be eligible for the prize of up to $20 in MFT Cash. Winners are chosen at random, so everyone has a chance! The prize is a $15 Gift Voucher to My Favorite Things, but if you use MFT stamps and/or dies in your project, you’ll receive an extra $5.